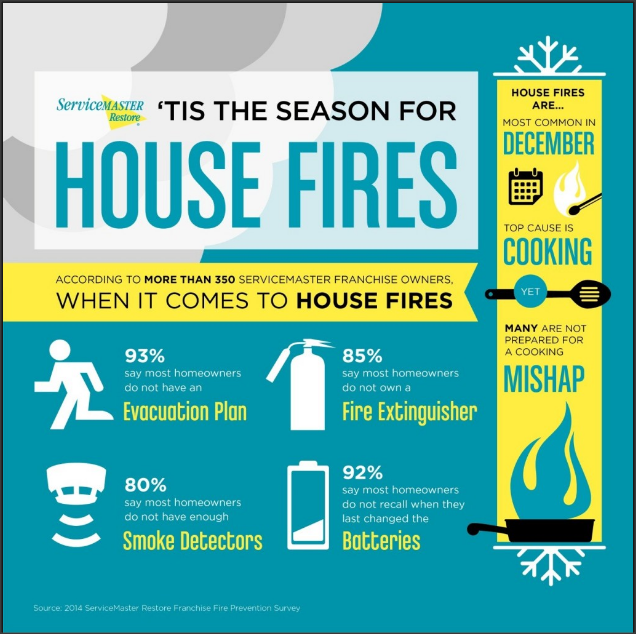 House fires are quite common during the holiday season. However, as we near the end of the holidays, fire safety in your home is no less important. The increase in cooking activities during the holidays leads to a high risk of fires, but cooking is the top cause of house fires throughout the entire year. Fires happen with very little warning and the modern construction of most homes causes them to burn up quickly. This leaves little time for escape, making prevention your best option. There are a few simple but necessary steps you can take to protect your home and your family from fires. Yet according to over 350 ServiceMaster franchise owners, a frightening number of homeowners do not take these simple steps. 93% of ServiceMaster owners claim that many homeowners do not have a fire evacuation plan. Creating a fire evacuation plan and practicing it with your family is important. If a fire occurs, there is very little time to escape. Having a plan beforehand will help you escape in the shortest amount of time. 85% claim that most homes don’t have a fire extinguisher. If a small fire breaks out in a home, you can put it out with a fire extinguisher. Make sure you have a fire extinguisher in your home to handle small fires. 80% claim that there are not enough smoke detectors in most homes. Generally, speaking, you should put a smoke detector in each room of the house. Smoke detectors alert us to potential fires and if a fire starts in an area where there is no smoke detector, the situation can quickly become dangerous. 92% claim that homeowners do not change smoke detector batteries often. The smoke detectors in a home must be functional to save you from a fire. Check and change the batteries in your smoke detectors often. A house fire is one of the most dangerous disasters because it can cause great harm to you and your property in such a short amount of time. Taking the precautions listed above will help protect your home from a fire and give you and your family a better chance to escape unharmed. Even with the best fire safety measures, it is still impossible to prevent them completely. If you experience a fire in your home, you must call a certified professional to provide fire damage restoration as soon as the fire is put out. These professionals will immediately neutralize the damage and prevent it from spreading.